Envigado is a tiny club playing their games in the Categoría Primera A, the highest division in Colombia. El Equipo Naranja is a family-friendly club. Their home stadium, the Estadio Polideportivo Sur, is often mostly filled with local families enjoying their days off. And those families, wearing the orange of Envigado, are the first to see the next Colombian superstars in line. Envigado have one of the best youth academies in South America and are well known for their high-quality youngsters. The next in line is a tiny playmaker who’s quickly capturing the hearts of all Envigado fans. Meet Yeison Guzmán, the next Colombian star coming out of the Envigado youth-ranks. Being born just south of Medellin, 19-year old Yeison Guzmán started playing football at the age of just 5 years old. He made his debut just over a year ago and impressed last weekend with an assist in a 2-0 victory over Rionegro Águilas. Envigado’s director, Ramiro Ruiz, has nothing but praise for the talented playmaker: “He’s excellent on the ball with a lot of technical ability. He likes going forward and is a leader in the team’’. The 5’5” Yeison has started in all three games for Envigado this season and has impressed in every single one of them. His playmaking abilities have been key in Envigado’s performances who’ve done extremely well in their opening games, winning two of them and drawing the other. His playmaking ability is superb for his age. He can comfortably ping both short-and long-range passes around. He knows how to pick a player out but what really sets him apart from his peers and teammates is the confidence and flair he puts in his play. Yeison knows what he’s capable of and isn’t afraid to show it. In the image below you can see Guzmán splitting Cortulua’s defence with a no-look pass, in just his 6th ever game in professional football. It’s that extra bit of confidence and flair that make him truly exciting to watch. Yeison has completed 84% of his passes in his still young career so far. A remarkable percentage, bearing his risky and enthusiastic style of play in mind. Yeison is a playmaker who likes to be at the heart of every attack, wanting as much of the ball as possible. He knows where the space lays and is always able to reach it with his pin-point passing. His confidence in his in own ability is a key part of his game, as stated above. He sometimes chooses the difficult option instead of the simple pass which can lead to controversy at times but often leads to sheer brilliance. A great example of this was his cross over the weekend against Once Caldas. He drifted out to the left, cuts onto his preferred right foot and swings in a perfectly lofted ball which reaches the head of Michael ‘Nike’ Gomez. Most players would have made the simple pass, which wasn’t necessarily a bad option. It was just that Guzmán’s confidence, vision and ability helped him creating a great chance out of nowhere. A chance that wouldn’t have been created if someone else was on the ball. It’s what sets him apart. His ball-delivery, both from crosses and set-pieces is a massive asset to his game. He’s already forced himself to be Envigado’s set-piece taker despite his inexperience, delivering some inch-perfect corners and free-kicks. He can do much more than just playmaking though. His tactical awareness is good. He knows where the space is and knows how to find it, also without the ball on his feet. Here we can see Guzmán dropping deep to receive the ball. He plays a one-two with his teammate in the created space and then drives forward with the ball on his feet at a remarkable pace. Yeison is a great dribbler as shown below. He can maintain his quality on the ball at a high pace where it sometimes may seem impossible to stop him. He’s difficult to dispossess despite his fragile figure. His great balance and agility allow him to stay on the ball when he’s pressured by his opponents. Running at the defence, leaving four opponents behind him, Guzmán noticed that Envigado’s #9 was offside, which limited his options. He opts for another one-two with English midfielder George Saunders who’s pass, unfortunately, wasn’t accurate. A decent ball over the top would have created a clear-cut opportunity for Guzmán. It was a decent attack nonetheless which all started with Guzmán dropping deep, being at the heart of the attack, just like usual. Here’s another example of Guzmán dropping deep and using a one-two to bypass a weak high-block from Once Caldas. Yeison’s shooting isn’t necessarily one of his strengths and definitely an area which can be improved. His unpredictability sometimes sees him unleash a missile from distance. The quality of these shots, however, is often poor, leading to a lot of blocked attempts. If he can improve his decision making on the shooting front we’ll frequently see his name appear on the score sheet. He did score his first goal for Envigado against Once Caldas though. 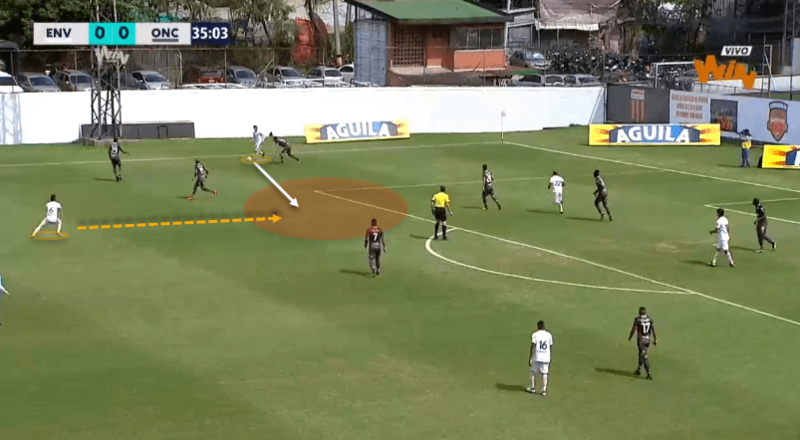 A hard low volley took a slight deflection leaving Once Caldas’ goalie with no chance. It was the only goal of the game, which saw Envigado securing all three points. Another showcase of his valuable impact despite his lack of experience. His praise at a young age has left him with quite some big boots to fill. Juan Fernando Quintero and James Rodriguez are two other playmakers that have come through the ranks of the Antioquia-based club. The former is currently wearing the colours of South American giants River Plate while the latter has turned into one of the best playmakers in world football. He’s still got plenty of things to improve: He’ll need to get more consistent and improve his stamina so he can keep going for the full 90 minutes. Yeison has stated that it would be a dream to play for Barcelona one day and it wouldn’t surprise me if the 19-year old eventually ends up at one of the biggest clubs in the world. His vision, confidence on the ball and passing ability make him a stand-out in the Colombian league already. This will be his breakthrough season and it’s up to him now to consistently shine in Colombia before making a smart move to Europe. It’s just a matter of time until he’ll appear on the radar of European football.